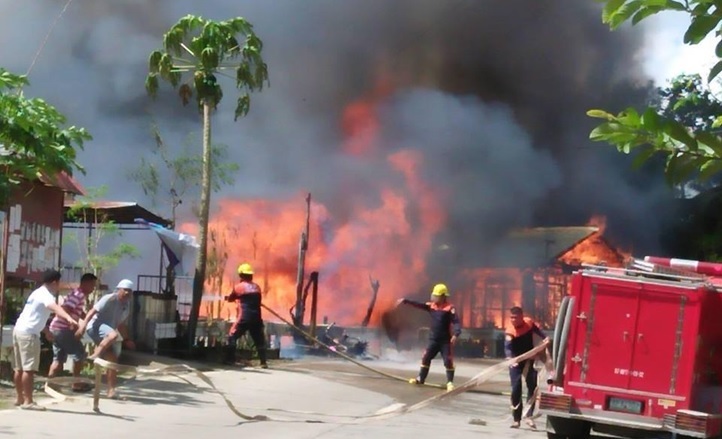 Three houses were razed to the ground by a fire which broke out in Carmen town in the morning of New Year’s Day leaving at least P238,500 worth of property damages. According to FO2 Gideon Cajes of the Carmen Fire Station, the blaze had already engulfed the three houses in Brgy. Nueva Fuersa when firemen responded after they were alerted of the fire at 11:10 a.m. There were no reported injuries due to the blaze. Cajes said that the fire erupted inside the house of one Samuel Buco, 43, due to “loose electrical connection” based on their initial probe. No one was inside the Buco residence when the fire broke out and spread to adjacent houses owned by Samuel’s brother, Guilermo Buco, 71, and Renato Hingone, 40. The fire was declared under control at 11:31 a.m., Cajes added. A firetruck from the town’s fire station and a water tanker of the local government unit were deployed to put out the blaze. According to Cajes, four motorcycles were also burned during the fire while the P238,500 worth of initially estimated damage did not include the costs of the destroyed appliances inside the three residences. A total of 50 sacks of rice grains were also burned during the fire.